Humanity used to fear nature, but these days we mostly pity it. The degraded environment is enough to tell us that nature is neither infinitely resilient nor untouched by our presence. No longer the monolithic threat or inexhaustible larder of yore, nature has become a cracked and vulnerable mosaic that needs to be patched up and coddled like a fragile thing, though it remains unmanageably vast. All of this raises the question of what kind of beauty or meaning we can hope to find in the landscape, and whether we can look at the earth at all without being reminded that we probably hastened its senescence. 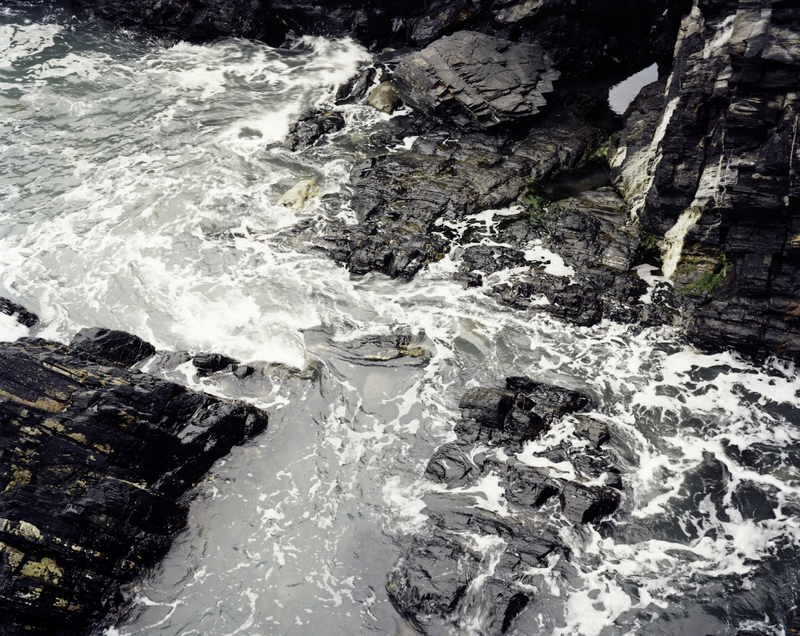 When Perry packs up his camera and turns away from the cliff, he knows that the water roils and froths, waves buffet the rocks, and an immeasurable range of colours, tones and textures are destroyed and reappear whether the shutter is open or not. Abereiddi, not to mention the whole planet, doesn’t need Perry’s attention. Perry the artist, however, needs Abereiddi. The aesthetic pleasure he finds in the landscape is tempered by his urge to remove himself – his subjectivity – from the process, an impossible goal that lends a certain melancholy to the project. Yet pleasure is, of course, subjective, and photography is journalism if it abandons pleasure. Perry knows that it is impossible to eliminate his presence by a kind of artless examination of a specific area, but he carries on regardless. The project, then, is doomed to fail, and its beauty rests in that failure, and in the photographer’s equivalent desire to carry on. Perry touched on similar ideas in his ‘Beach’ series, but – let’s be precise – the group of photographs Perry has taken at Abereiddi do not constitute a series. While the ‘Beach’ photographs are unified by Perry’s systematic compositional approach, Perry has loosened up considerably for this group of pictures, evinced by the title itself: Beach is an idea, ‘Abereiddi’ is a specific location in Pembrokeshire, Wales. Perry is less introspective at Abereiddi. Perry’s ongoing interest in abstract art and its relation to Modernist photography remains a powerful stimulus at Abereiddi. The flattened space and vertiginous perspective allow abstraction to overtake depiction. The combination of dark, intractable blocks of stone and scribbles of white foam suggests the alternating spaces of order and turmoil in a Jonathan Lasker abstract. Water pools in the bay and between rocks like washes of cool, translucent pigment. In one picture, a patch of sky, reflected in a still pool in the upper right of the picture, glows with a purity of blue like some celestial witness to all this non-stop impermanence. In another, taken perhaps just minutes later, the same pool shivers with sudden, extraordinary beauty. These seascapes bring to mind William Blake’s grain of sand in which he asks us to find infinity. The sea foam dances and twirls like creamy nebulae in the Milky Way. Look again and the whole universe seems to be crashing against the rocks. Surely that’s enough. Indeed, it’s more than enough, but the formal elements will never supersede the limitation – and genius – of photography: no matter how lost we get in the reverie of colour and pattern, we always return to a recognisably specific spot, and a tiny, irretrievable moment. Even so, a grand idea of nature, however we conceive it, is seldom far from our thoughts. The Stoics thought nature, god and reason were one and that peace of mind was achievable only by obeying theirs laws. Baudelaire, on the other hand, saw nature as a filthy inevitability, the origin of all vulgarity and vice. “Good”, he said, “is always the product of some art”. Perry’s photographs set out to find a whiff of both goodness and art. The goodness is in the pursuit of objectivity, which is also an implied ethics of looking at the natural world; the art is in the pleasure he finds, and captures for us, in it’s surfaces. A photograph will always fall short of capturing this ideal, but for Perry, photography is a method to carry on and a ritual to placate a few angry gods. And all gods, William Blake reminds us, reside in the human breast. Mike Perry’s photographs reveal that nature’s dreadfulness, and its indifference, is ours, too. Its beauty is it’s own.